A young man has been arrested for egging Queensland senator Fraser Anning during a political meeting the day after he blamed the Christchurch terror attacks on immigration. The incident happened while Mr Anning was speaking to the media at a political meeting at Moorabbin, in Melbourne's south-east. 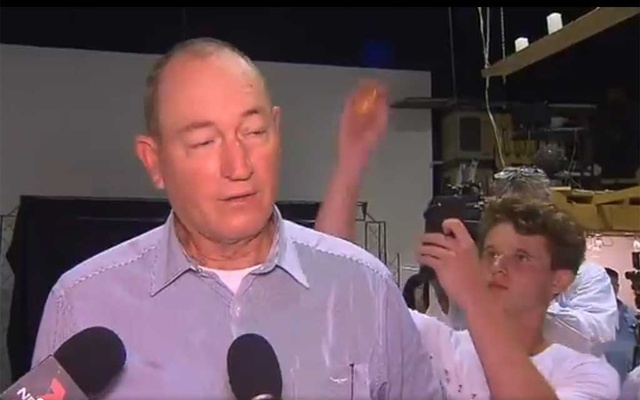 Footage of the incident shows a young man watching Mr Anning from the sidelines before he starts filming with his mobile phone, and then smashes the egg on the back of the senator's head. In response, Mr Anning swings two punches at the young man, at least one of which connects with the young man's head. A staffer for Mr Anning then separates the senator from the young man, while supporters of the senator tackle the teenager to the ground. The young man was later led away by police. A Victoria Police spokesman said officers arrested a 17-year-old boy from Hampton who was released pending further inquiries. A fundraising page has already been set up to collect donations to cover the teenager's legal fees and to buy "more eggs". Prime Minister Scott Morrison today announced the Coalition and Labor would pass a motion when Australian Parliament returns next month, censuring Mr Anning for the statement he issued yesterday that linked the Christchurch mosque attacks to immigration. "I would normally not want to give this any oxygen, but I want to absolutely and completely denounce the statements made by Senator Anning…on this horrendous terrorist attack, with issues of immigration, in his attack on Islamic faith specifically," Mr Morrison said. "These comments are appalling and they're ugly and they have no place in Australia. He should be, frankly, ashamed of himself." Opposition leader Bill Shorten said Senator Anning's comments were "disgusting". "The senator in question, I do not think operates by the beat of the same drum as the rest of us," he said. "I cannot dream what world a politician or any Australian is seeing by blaming their victims and the faces of those being murdered. "It is disgusting and has no place in the Australian Parliament and hopefully the voters will deal with this fellow in the most effective way. "He should be put at the bottom of any political party voting." About 60 people attended the meeting in an industrial part of the suburb at which Senator Anning spoke. Almost as many counter-protesters demonstrated outside the meeting. Far-right agitator Neil Erikson was controlling access to the building. Last year, Mr Erikson was convicted of inciting serious contempt against Muslims, over a mock beheading he staged in the regional Victorian city of Bendigo in 2015.